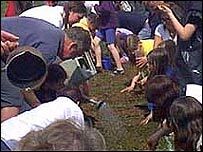 Hundreds of people are expected in a Devon village on Sunday to take part in a worm charming contest. The event has been held in Blackawton in the South Hams since 1984 and attracts teams from across the UK, Europe and beyond. The winner is the person or team who can charm the greatest number of worms from a patch of grass measuring one metre square without digging the turf. Strict rules are enforced to prevent any cruelty to the worms. The current champion is from New Zealand but local people are hopeful the shield will return home this year. Local Worm Master Nick Smith says methods of encouraging the worms to the surface can vary, but generally include instruments to mimic the sound of rain and some rather unusual combinations of liquids. He says dress plays a big part too adding: "I've got my green wellies, an ex-vicar's cassock and a hat. "I use a bim-bam, a pair of 'come-nearer-scopes' and a watering can which is filled with beer, gravy granules, sugar and water." One of the competition rules is that contestants must sample the elixir they intend to charm the worms with beforehand to prove it will not harm the creatures. Mr Smith added: "We've got people on patrol for anybody who may be cruel to the worms or pull them in half to make two worms." The field used for the contest is kept a secret until the last minute. Mr Smith says it has been known for some people to use a bit of skulduggery and put worms in the ground in the hope of retrieving them on the day. Taking part in the festival on Sunday is free, but places should be booked by 1100 BST and the event will raise money for the Devon Air Ambulance.